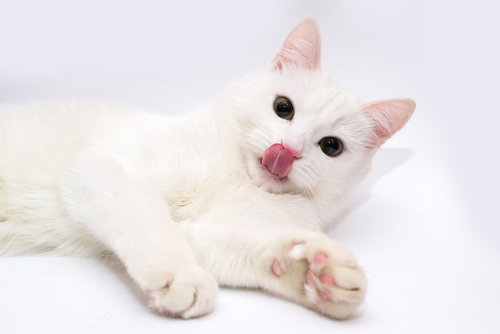 The tongues of cats are covered in claw-shaped hooks that spring into action when it’s time to groom. Built-in scoops carry saliva to the skin to cool it down. A team of mechanical enginees reported the findings Monday, and say they’re more than a curiosity. They could lead to inventions for pets and people. “Their tongue could help us apply fluids, or clean carpets, or apply medicine” to hairy skin, said Georgia Institute of Technology lead researcher Alexis Noel, who is seeking a patent for a 3D-printed, tongue-inspired brush. First, CT scans of cats’ tongues showed that they’re not covered in solid cones but in claw-shaped hooks. They lie flat and rear-facing, out of the way until, with a twitch of the tongue muscle, the little spines spring straight up, she explained. Next, Noel measured cat fur, which holds lots of air to insulate like a down jacket. Sure enough, compress that fur and in numerous types of cats, the distance to the skin matches the length of the tongue’s spines, she found. An exception: Persian cats with their superlong fur, which veterinarians caution must be brushed daily to avoid matting. A machine that mimicked the strokes of a cat’s grooming found that saliva from the tongue’s surface alone simply can’t penetrate as deep. And a thermal camera showed that as the cats groomed, evaporating saliva cooled them.